This article, published in the Nature Scientific Report, explain “why humans unwittingly build fires that look the same: edifices of fuel, as tall as they are wide. The pile of fuel is permeable, air invades it by natural convection and drives the combustion.“. The article “show that the hottest pile of burning fuel occurs when the height of the pile is roughly the same as its base diameter. Future studies may address the shape effect of wind, material type, and packing. Key is why humans of all eras have been relying on this design of fire “unwittingly”. The reason is that the heat flow from fire facilitates the movement and spreading of human mass on the globe“. 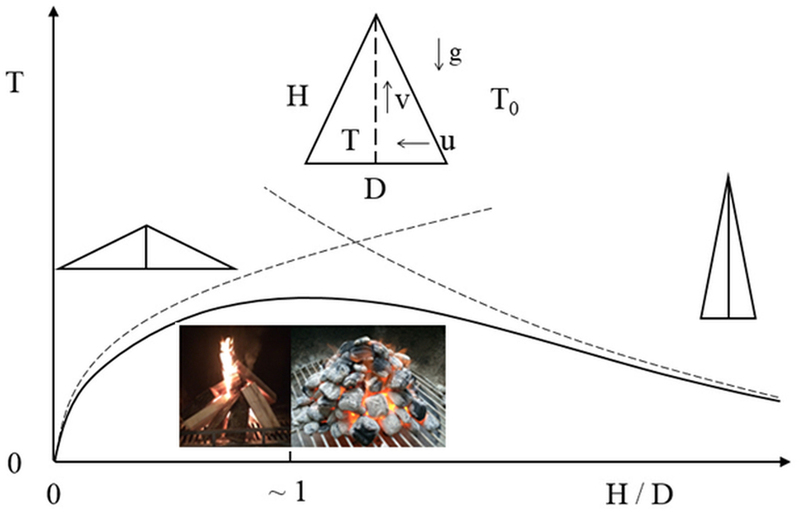 A. Bejan, Why humans build fires shaped the same way, Scientific Report 5, Article number: 11270, Nature.com, doi:10.1038/srep11270. I am quite excited by all I’m learning of the constructal law and theories. It seems to me the closest thing to a ‘theory of everything,’ if you think of everything from the big bang to be part of the universal flow. Which is why I’m frustrated to see this random focus on fire logs. Constructal law is so much bigger than this article conveys. I hope to see constructal theory applied e.g., to quantum mechanics of subatomic particles/waves. Why would particles/waves behave (move) the way they do, if not because it is the most efficient design for flow of that energy/matter? If constructal law does somehow apply at subatomic levels, how cool would that be?